comScore Media Metrix releases its November 2009 US internet audience rankings, and Technorati Media's ranking climbs to 27.6 million US unique visitors. 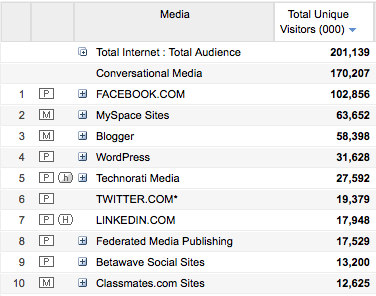 Technorati Media's monthly increase in audience solidifies its #5 ranking of the largest conversational/social media properties, placing us behind Facebook, MySpace, Blogger and Wordpress (and ahead of Twitter, LinkedIn et al). Note: comScore audience measurements are based on a combo of panel and census data, and is the most widely used third party measurement for the online advertising industry; Technorati Media's actual worldwide traffic is well over 125 million unique visitors per month, with two thirds being US traffic. Congratulations--that's great. I have found Technorati to be a very helpful site both for a little bit of promotion, but mostly for doing research on what other successful blogs are doing. I always enjoy reading the state of the blogosphere as well.